Successfully Added UFO LED Mood Light - 150 Lumen, 256 Colors, Portable, Auto Color Change to your Shopping Cart. Power by 2 x AAA batteries or via the USB DC in lead. 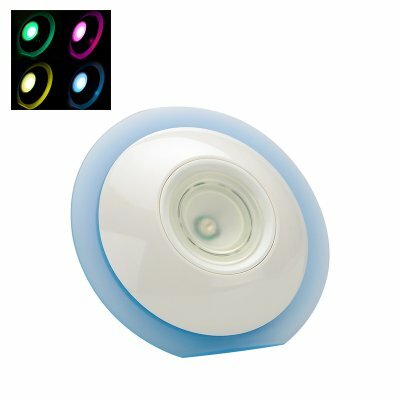 This unique UFO Shaped LED mood light emits a full spectrum of 256 hues that will enchant and set a magical atmosphere in your home. This decorative LED light makes for a wonderful holiday decoration and can be used year round as a night light, party light or to add some color to your car. A room can change drastically by adding the correct lighting and with this colorful lamp you will be able to adjust the feel of any room. The color select bar is easy to use, letting you select the color you want with a simple touch. Selecting warm oranges and yellow infuses the room with warmth while reds and pinks set a romantic scene. If you’re going to watch a thriller then a cold blue accompaniment to a showing of Jaws and will set a shiver down your spine. Alternatively leave the light choice up to the lamp and bring any party to life. Powered by a couple of AAA batteries or via the DC to USB power lead this mood light doesn’t need to be plugged in to work so you even use it outside. This 150 Lumen LED mood light comes with a 12 months warranty, Brought to you by the leader in electronic devices as well as wholesale LED lights..